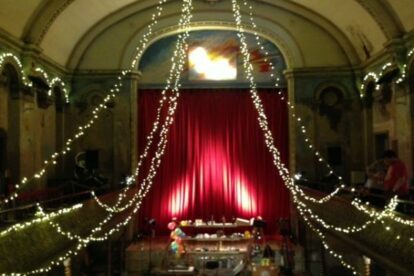 Few performance spaces in London have as many passionate fans as Wilton’s Music Hall. There were many instances throughout its history when its fans thought the Hall may be closed or even torn down. However with a restoration project underway, Londoners can still enjoy the historic atmosphere that people centuries before have enjoyed. Appealing to as many audiences as possible, Wilton’s hosts concerts, theatre, cabaret, film evenings and even dance classes. I recently saw a performance by the Fitzrovia Radio Hour whose radio plays made a perfect match for the Hall’s lively atmosphere. For those who are more interested in exploring the Music Hall’s history, there are tours on most Monday evenings – just be sure to check the website to ensure spaces are available on the tours! Want to soak up the atmosphere but don’t have a ticket for a show? Then step into the Mahagony Bar – a space even older than the Music Hall itself. It makes for a more sophisticated evening than the usual pub-around-the-corner.